While I was puttering around outside (an admittedly rare occurrence), a deep thuttering over the northern horizon eventually resolved into a formation of four helicopters. 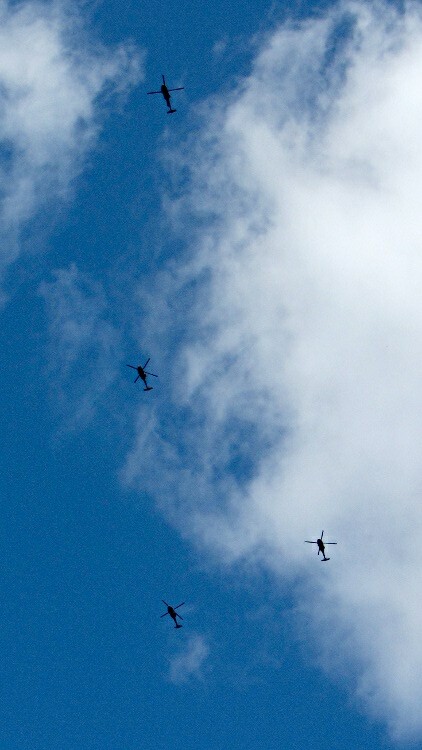 Hard to tell at this range, but they looked like Black Hawks southbound for the Stewart Air National Guard field. Our Larval Engineer reports that the college ROTC contingent includes some pilots-in-training who regularly land Black Hawks on the campus outfields.